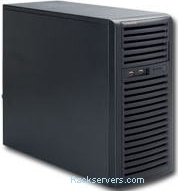 Description Compact Mini Tower server case, 4x Internal 3.5" HD/SSD bays with 12Gb/s SAS3 support. 2x 5.25" External Bays. 300W high efficiency PSU.